Yesterday it was a good example of how a very bad intro could turn into a wonderful night. 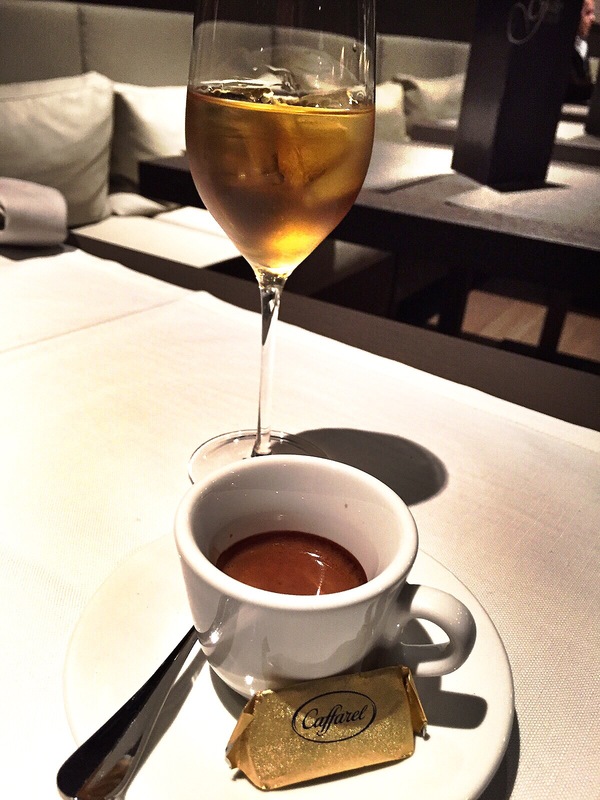 To welcome the new year in style, Anna and I had decided to try the new Truffle Bistrot in town, San Maurizio. As we wanted to be sure to have our table, we reserved before vacations so yesterday evening, after the usual drink at Café de Paris, we headed to this restaurant, that opened at the beginning of December just next Hamilius. We got there and.. surprise! It was closed! I was really pissed – can you imagine? I clearly remember I asked twice to the lady who replied at the phone if they were opened on January 6th – I know in Italy it is vacation. They took my reservation and my telephone number – and they did not even bother to call to advise, not the best way to start a business. I was also pissed because, for one second, I did not find in my mind any exciting place to head at 8.30 pm without taking again the car or a cab. Then, suddenly, I recall this new Italian restaurant I passed in front on Christmas night, just off Place d’Armes, in rue du Cure. Hungry and a bit disappointed, we arrived at the door of Giallo restaurant – what else could go wrong tonight?, we said ourselves. Indeed – it was a fabulous dinner. 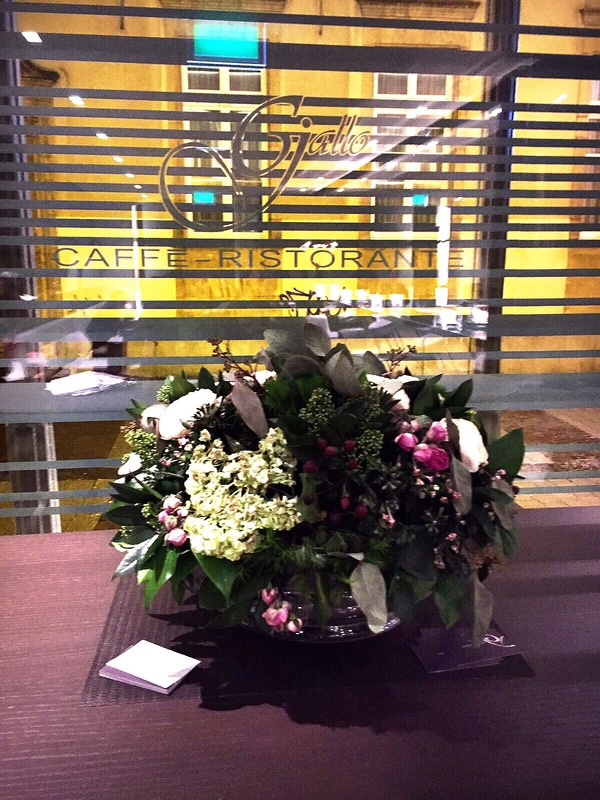 The restaurant was opened for the last 15 days – they explained us at the very end – for a kind of trial period. They will be closed from Sunday for the next two weeks for some final renovation works and will be finally open again. The main room is not huge, but the mirrors on both sides are hiding it pretty well. They also have two tables on the lower level, next to the kitchen, more intimate and romantic. The menu for the night proposed a choice of starters, primi piatti and main courses, well divided between fish, meal and veggie. Plus desserts. 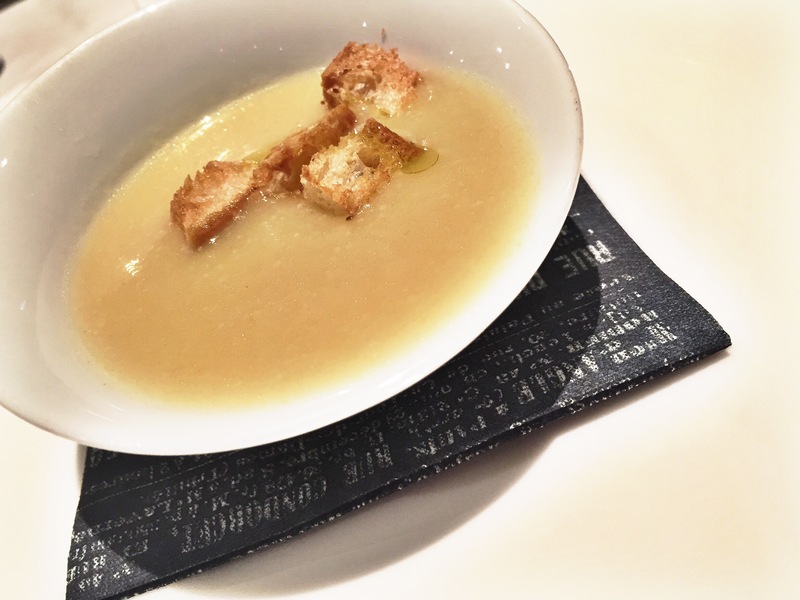 We started with a delicious welcome from the chef (potatoes soup with toasted bread and truffle). I went for fried egg with potatoes and endive, while Anna had octopus soup with garlic bread. 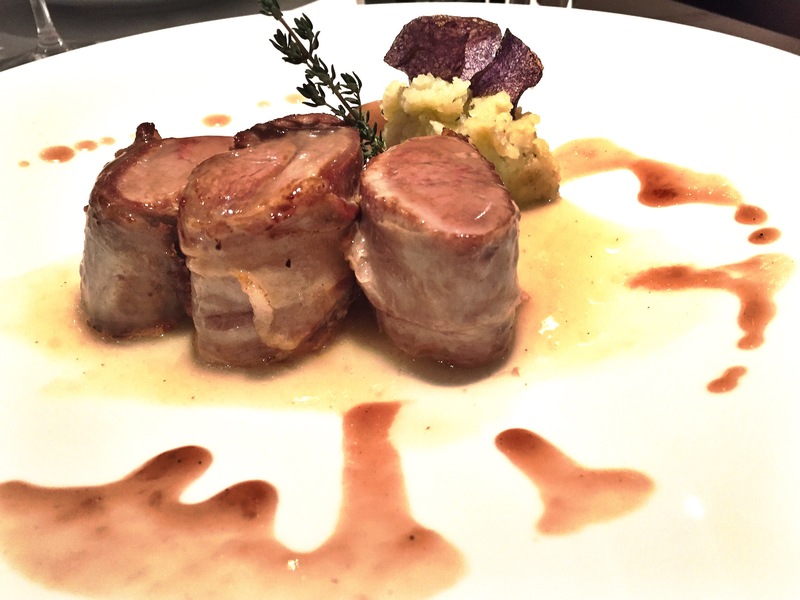 I then continued with pork filet with aromatic vinegar and potatoes while Anna had eggplants parmigiana. 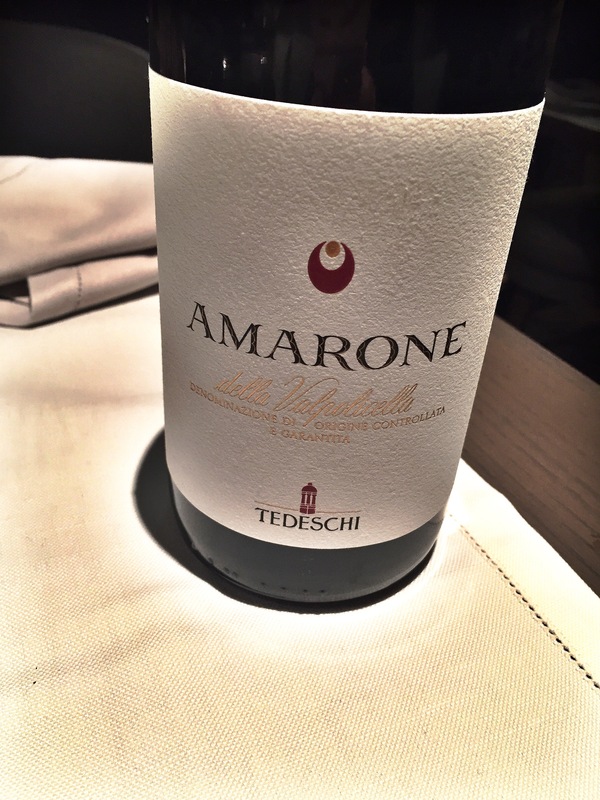 As wine we had a good Amarone Valpolicella. Find some pictures of the place and of our dinner and, after them, my opinion of Giallo restaurant. 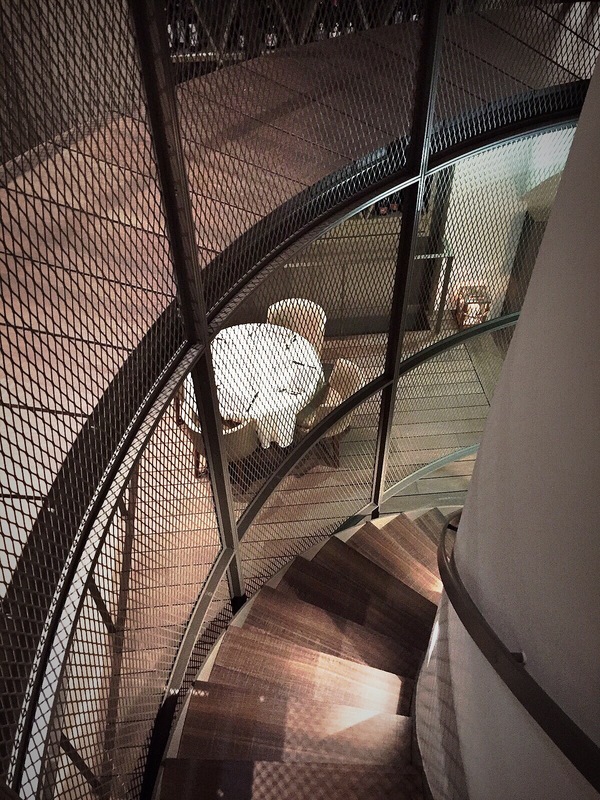 – I basically loved everything – even if I really need more than one visit to fall in love with a place, I can definitely state Giallo jumped at the top of my preferences in the city center. – The atmosphere is sophisticated and refined, classic but not boring neither old-fashioned. A perfect bond between elegance and minimalism, with great attention to details and relaxed settings. I adore the fact you are overlooking the street but you have your privacy, appreciate how the bar is settled just informally at the entrance and was surprised by the tables just down the stairs, in a lovely romantic recess. 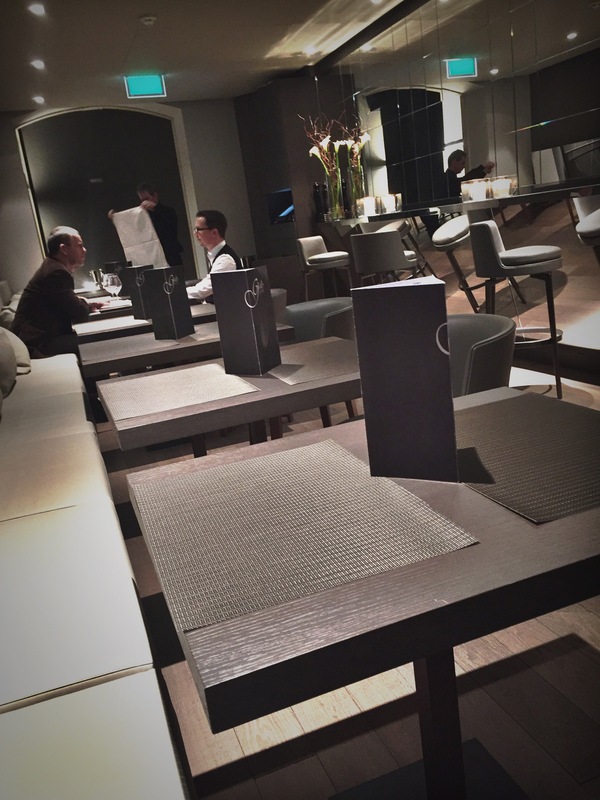 – The food was incredible, totally out of the scheme of the Luxembourg scene, different, deep, complex. 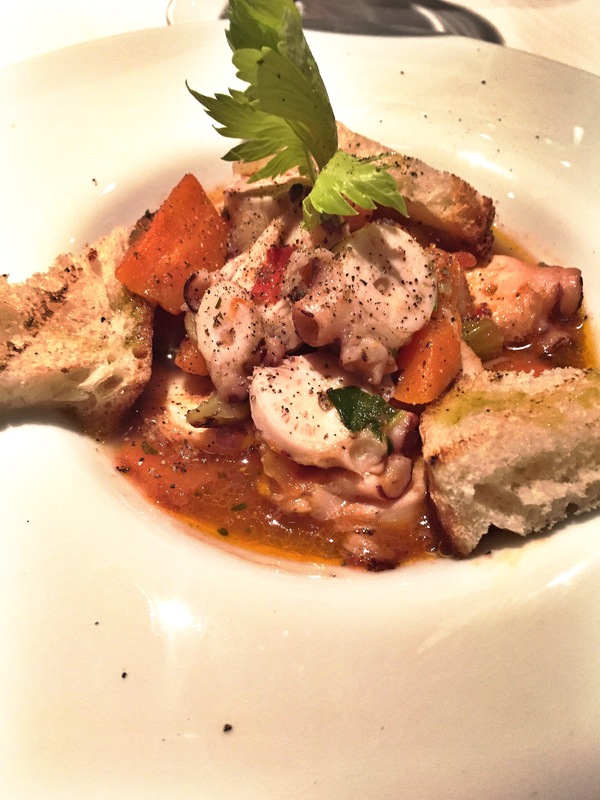 Genuine ingredients, simple combinations, amazing presentation. I was so glad to finally see something new, something we are not used to in Luxembourg, that surprises your palate and spoils your tastes. The amuse-bouche was a gem, the fried egg tasty and the mix with the veggie resulted just perfect. The pork was right on point and we finished our dinner full and, above all, satisfied. – As said, I loved the attention to details – including the fact, we got served a Caffarel Gianduiotto with the coffee – my real favorite Italian chocolate. – The service, as well, was just perfect – I know I used the word perfect maybe too much, but indeed it was needed. Always on time, discreet, smiling. We got the wine, we got the timing for the dinner, we got the dishes, we got a nice small talk at the end. 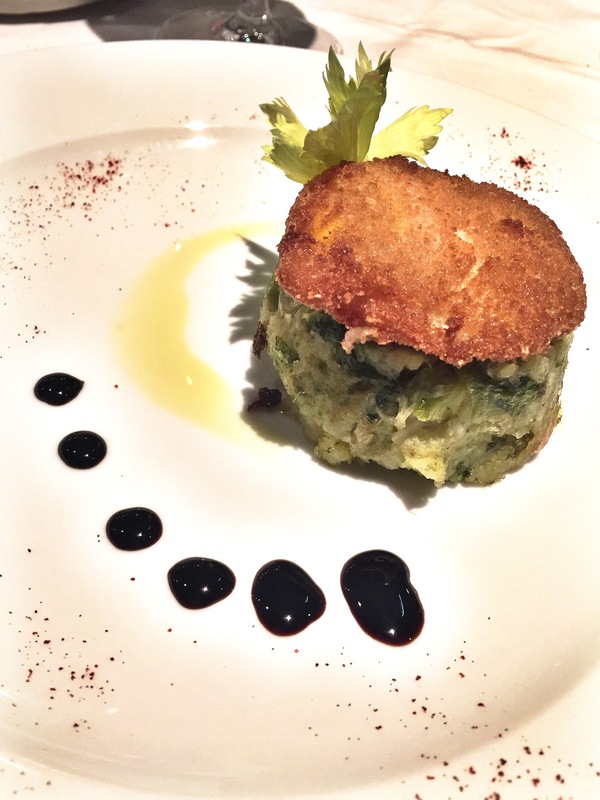 – Prices are competitive: starters around 15 euros, primi piatti from 16 euros, main courses from 18 to 30 euro. Great, I would add, considering you are in the very city center and that portions are fairly big. Wine list has also honest choices, between 25 and 80 euros, with only few bottles at “more than 100 euro” level. – As said, everything was great. If I have to find two small points: first, if you are up for a date, reserve the table at the lower level, more privacy. Our next table was empty, as the restaurant was not complete, so we were pretty happy about the accommodation, but I would have not liked, personally, eating with a stranger next elbow. It should be said, as my partner in crime noted, that the concept is kind of brasserie, therefore, based on that, spaces are fairly correct. 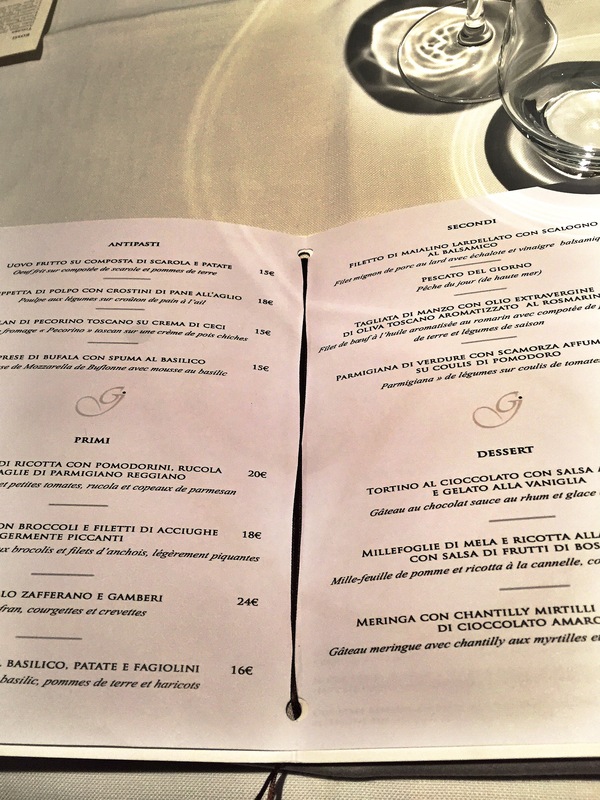 – The “white wines” list is currently embarrassing – only two Italian wines, both at 30 euro. I would have really appreciated if the choice was wider. There are some great Italian white wines, above all considering we are in an Italian restaurant, I hope they will stock something more before our next visit. 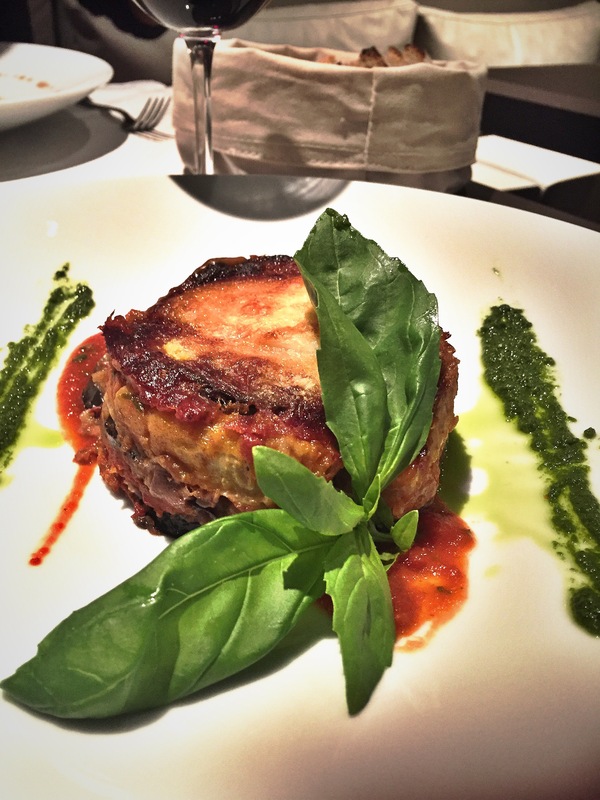 In conclusion: we were pleasantly surprised by Giallo restaurant: innovative and tasty food, perfect service and cozy location are making it a great promise on the restaurant scene in Luxembourg. I hope they will keep up the good standards they had on this our first visit. We will definitely come back. Oh wow that’s definitely not the best way to welcome a new customer,I would have been pissed as well since I tend to get pretty hangry haha.